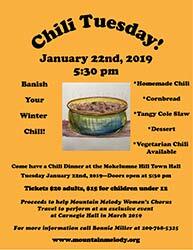 Chili Tuesday is happening January 22nd at the Moke Hill Town Hall!! Doors Open at 5:30 pm. Proceeds from the event go to benefit Mountain Melody Women’s Chorus to help them get to New York City to perform at Carnegie Hall in March of 2019. Mountain Melody has been asked to join an exclusive international women’s choir to perform at this legendary venue, and they are thrilled to be representing the California Gold Country Region. Mountain Melody has been invited by Distinguished Concerts International New York City (DCINY) to participate in this exciting event. There will be 15 singers from the chorus making this trip, many who have been in the chorus since its inception in 2005, under the artistic direction of founder Julia Shelby. Mountain Melody is looking forward to this event with great anticipation, and as always, we are so grateful for the support we have and will continue to receive. “Mountain Melody received this invitation because of the high quality and high level of musicianship demonstrated by the singers as well as the high quality of their audition recording. It is quite an honor just to be invited to perform in New York. If you can’t make it to Chili Tuesday, but would still like to help Mountain Melody, please go to the gofundme page. I received a phone call from a representative from Distinguished Concerts International New York (DCINY) informing me that she had heard us on line and was quite impressed with us. She was calling to invite Mountain Melody to participate in a performance of Magnificat- Music for Women’s Voices at Carnegie Hall in the spring 2019. We will be part of an international women’s chorus. I brought this idea to Mountain Melody and we accepted. So, my contact sent our online performance to the audition committee and we were given a formal invitation to participate in this international concert. Needless to say, Mountain Melody is excited to be invited, especially when this was literally dropped in our laps out of the blue. We look forward to representing Calaveras County to the rest of the world! Please support our trip and Donate any amount. Get Your Mountain Melody Tee Shirt or Mug! A cool design and it’s a quality tee available in lots of sizes! If you plan to buy, please do so soon because this campaign will be ending. Marisa Miller at Frog Jump 2017! Mountain Melody’s own Marisa Miller will be belting out the tunes at Frog Jump 2017!!! 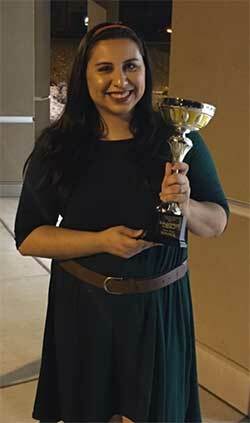 Another finalist–note the fancy “loving cup” she is holding—she will be performing popular Broadway melodies and other favorites in her beautiful soaring soprano voice!! As well as being a fabulous singer, she is also a real life Disney Princess!! 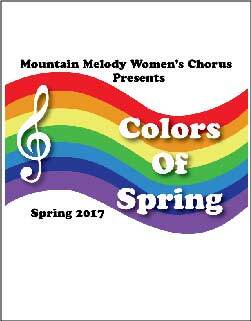 Mountain Melody’s Colors of Spring Tee Shirt, Mug and Sticker! Please visit TeePublic to view all these items. Limited time offer. 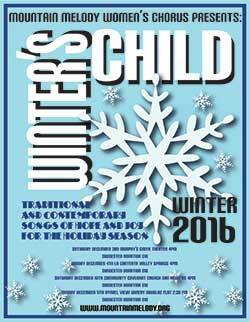 The Current Events page has a complete list of performances! Grace Baker, and Tari Takara (of Mountain Melody) as part of their winnings from the “Calaveras Has Talent” talent show in 2016 (they made it to the finals) will be performing at Frog Jump 2017. 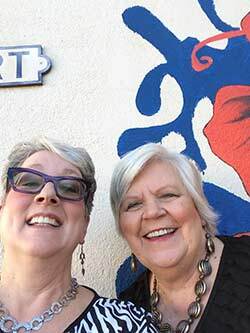 They will be bringing their special brand of Old Timey Music and signature lush harmonies and ukulele strumming to the Frogtown main stage in Angels Camp. Joined by local musicians Jeremiah Heath on Guitar and David Sackman on Chapman Stick, they will be featuring tunes by Chuck Berry, The Everly Brothers, Buddy Holly, Bettie Boop and more! Please come out for a fun and family friendly day on May 21, at the fair!